A wonderful and perfect second book in a series. It’s not often a second book is so good, but Demonglass managed to pull it off!! I think I said it already often enough but I somehow loved stories that involve boarding schools and such. But what makes this series stand out is the wonderful tone the characters have. Sophie: Miss Snarky & Sarcastic! Sophie is one tough and sarcastic main character and I LOVE her snarkiness above everything else. But still, she’s just a young girl trying hard to come to terms with her being a demon and hunted by her first crush Archer! The book starts some time after the events of Hex Hall and Sophie is still determined to get through the “Removal” to get rid of her Demon Magic. Her father invites her and Jenna (her Vampire girl friend) to spend the summer with him in England. To make things even more complicated he also invites Cal along – who I honestly and seriously forgot as a character from the first book. Yet, here in Demonglass he has a great role and I absolutely loved getting to know him better! Of course, there is still Archer lingering in Sophies thoughts and although she knows he’s a member of The Eye she can’t forget this one kiss their shared. Also, he’s last seen in England – which might spice things up if the’d run into each other. Loved the building relationship with her Dad and as I said above Cal showed to be a wonderful character and certainly can’t be missed in here. The book is really faces paced and there is a lot happening. you are never bored. Plus, mysteries over mysteries like: Who are Sophies new Demon friends that seem really weird although everyone is telling her they are good people? But the biggest question remains what’s up with Archer and The Eye! Absolutely horrible in a *I-can’t-believe-this-book-ends-here* way, I was seriously turning back and forth in denial that this is the way Demonglass ends. Now, a horrible wait for the next books comes.. But still, this series is wonderful, with captivating story lines and awesome characters! 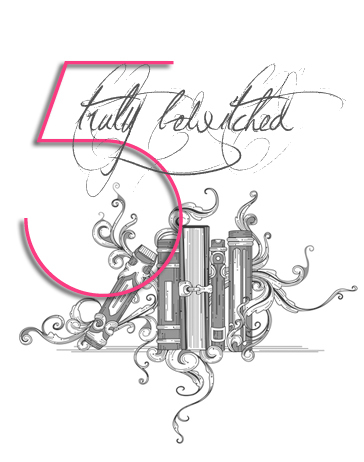 It full deserves a truly bewitched raring here. Lot’s of new and captivating story lines will leave you on edge and lets you turning the pages faster and faster! But the best thing about this book for me are the characters and especially Sophie! I absolutely LOVE her sarcasm but still sometimes she’s so vulnerable although she tries to be so brave. So if you haven’t start the series yet and love a good paranormal, boarding school, lovely romance mixed novel with great characters, then.. go ahead and pick up this series!! So girls, have you read Hex Hall? Thanks for a fantastic review. I've got this one sitting at home that I really need to get around to reading. Be warned though, the ending is horrible!!! But I really enjoyed that one! YES! I loved this one so much too and was so pleased it was as good as book one (if not better). I was worried that it wouldn't live up to Hex Hall, but I shouldn't have worried at all. I love a snarky girl, so Sophie is one of my all time favorite heroines:) Loved this review Danny! Well I've had this on my WL and been desperately wishing for it, but if it has a horrible ending like that maybe I should wait! So glad you ended up loving the book though! I, like you, just LOVED this book! I think I may even have liked it a little better than Hex Hall, but I DO LOVE this series! I LOVE Sophie's snarky personality and all the other characters are GREAT! If you've ever read her blog, I feel like she brings her personal sense of humor to the table in both of her books! 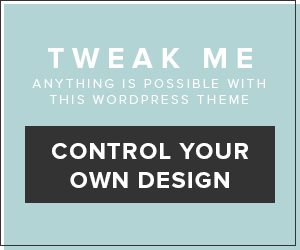 Her blog makes me laugh out loud and wish I had somebody to share her posts with! I can't wait for the next book!! What a cruel way to leave us hanging!! Thanks!!! Yes I do love snarky girls too, which is one reason why I loved Clarity and THE DUFF!Seriously this is an awesome second book in a series although I truly hate the ending … such a cruel cliffhanger!!!! The second book totally pulled it off! LOVED IT! The I can't believe it ended like this thing totally had me blowing steam outta my ears! Can't wait for more. And, your Boyfriend Feature came right at the time when I was wondering about Cal!Awesomeness!Honey, do you see? We agree again! Yes it does end with a heavy cliffhanger. But it will be worth it, so in this case I would even suggest readingit instead of waiting! Oh I'm so torn! I loved Cal and I want more Sophie fun but…..CLIFFHANGER!!?!? And a really bad one? Arrghh. I'm thinking of maybe returning my copy to the library and reading it closer to book 3's release. But can I wait that long? I mean, it's CAL, you know? My fiance totally doesn't get the severity of my dilemma here. 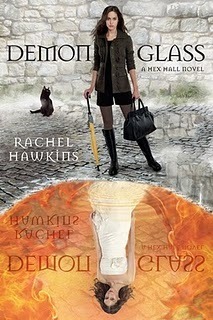 I love love love Hex Hall and just posted my equally glowing review of Demonglass. I was totally pissed about the ending. I had the same, "No! It can't end here!" reaction you did. And, Cal – total swoon. I love him – so glad he was around more in this book. I can't wait for the next one to come out.